“He got sick so fast,” says Dawn Legassey. Her family was vacationing on Cape Cod when their dog sitter called to say her son’s pit bull, Cesar, had a lump under his jaw. The family rushed back home to Uxbridge, Mass., and found “his neck so swollen I was scared he’d have trouble breathing,” Legassey says. Veterinarians at Tufts’ Foster Hospital for Small Animals diagnosed Cesar with canine lymphoma. One of the most common cancers in dogs, the disease attacks the white blood cells called lymphocytes that help fend off infection. The cancer is most often found in the lymph nodes, causing fast-growing lumps around the neck, shoulders, armpits, knees and groin. Canine lymphoma responds well to chemotherapy, which can extend a dog’s life for about a year, on average. For Cesar’s type of lymphoma, chemo generally extends survival rates six to nine months. “I knew people who had undergone chemo, and they had gotten very sick from it,” says Legassey. “I didn’t want to make him go through that.” However, Tufts veterinary oncologist Lisa Barber assured her that most dogs tolerate chemotherapy very well, better than human cancer patients. Legassey agreed to the standard 16-week chemotherapy treatment for Cesar. She also enrolled him in a clinical trial investigating a new way to deliver high doses of the common cancer drug cyclophosphamide. 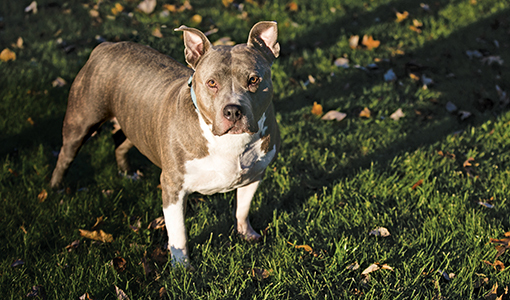 While initial results with this therapy have been shown to prolong remission in canine patients, the animals also needed a bone-marrow transplant to bolster their immune systems and ward off potentially fatal infections. Cummings School researchers are testing the effectiveness of a less-invasive approach—one that replaces the transplant with a combination of antibiotics and a hormone-like drug that boosts the bone marrow’s production of the infection-fighting white blood cells. Cesar breezed through his chemotherapy, including the experimental treatment. Three years later, the 7-year-old dog remains in full remission and “a puppy in his head,” says Legassey.